Archie's band recently confronted mp3 pirates, as the 67-year-old teenager struggles to adapt to digital technology and a changing world. Yes, 67 years. Archie first appeared in 1941 — the cartoonist's mother was a Ziegfeld girl in the 1920s — and the characters were based on teenagers the cartoonist knew in the 1930s growing up in Northern Massachusetts. But now that he's approaching 70, Archie has started flashing around the latest technology in his plucky comic book digests. There's web sites, text messages, mp3s, and file swapping — all pushing a new image for 2008. 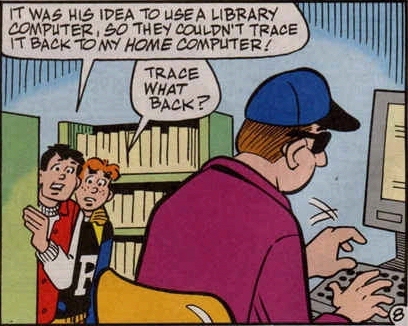 Archie apparently got his first PC in 1995 — which he used to troll online dating services looking for dates. 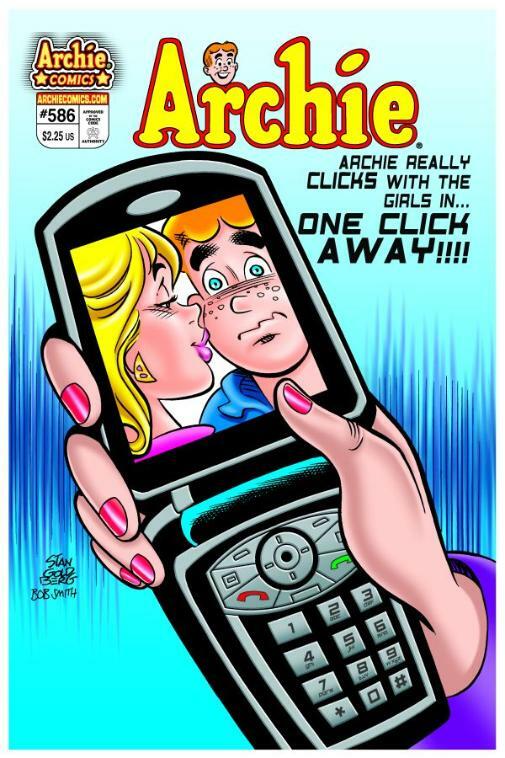 (According to Archie Digest Magazine #137 his first message was a full-screen image of Veronica, barking "How dare you use this computer to find girls! Why I oughtta...") But the matrix had set him on a collision course with music pirates — even if it took 40 years. 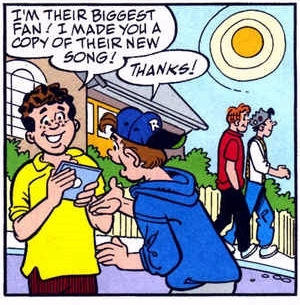 That fateful afternoon when Archie and his gang lost their innocence came in Archie #577 — when they discovered that their music was being pirated. 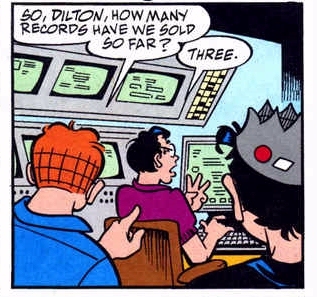 "Lets find out just how rich we are," Archie says cockily as they stroll into Dilton's downloading command center. 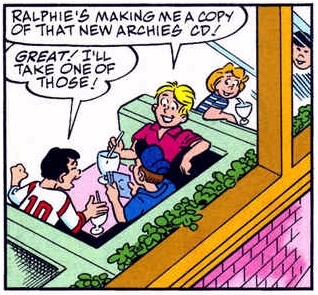 Archie's music career was over before it began, apparently doomed by his failure to implement an infrastructure for harassing Riverdale's music pirates. The story ends with Archie and Jughead sadly going back to their day jobs at the burger joint, now working double shifts to earn back their money, and abandoning the band altogether. But then again, Archie's been working there since Roosevelt was President, cracking jokes he inherited from his father's vaudeville act. But there's one voice in Riverdale who might understand — and it's not the school principal Mr. Weatherbee. Ron Dante was the real voice for the Archies, singing on all 100 of their records (and at least once even performing as the voice of Betty). At 63 years old, he's watched the music scene change — and in a 2000 interview, Dante shared his thoughts about online music. In a world of fluff and filler songs, "you'll see the really good stuff rise to the top of the Internet at some point," he predicted optimistically to Cosmik Debris magazine, "and people will be able to judge for themselves. It's a revolution. It's going to change the world of music as we know it. "It's evolution, too. We have to go through this." 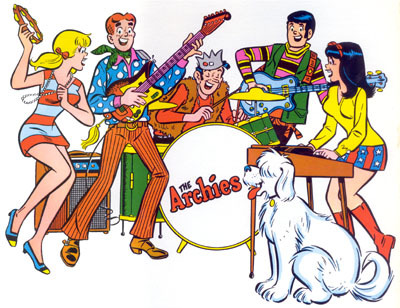 Even though he created the Archie's music, he laughed off the teenaged pirates that are now harrying Archie and Jughead's band. "With all this hubbub about record people worried about the Internet, the record business is up ten percent. Instead of ten billion, it's thirteen billion this year. "So I'm not too worried." You can see some interesting Archie comic book covers here. Until Jughead uses his computer to pick up a young girl only to wind up face to face with Chris Hanson on an episode of Dateline NBC, they’ll be behind the times. There’s no fighting the “pirates”. The more advance technology gets, the easier it will be to grab mp3s. I disagree with Ron Dante’s assessment. I think with the ease any kid can make a song electronically with his computer, the internet will become oversaturated with music and even the best artist will just skim by.